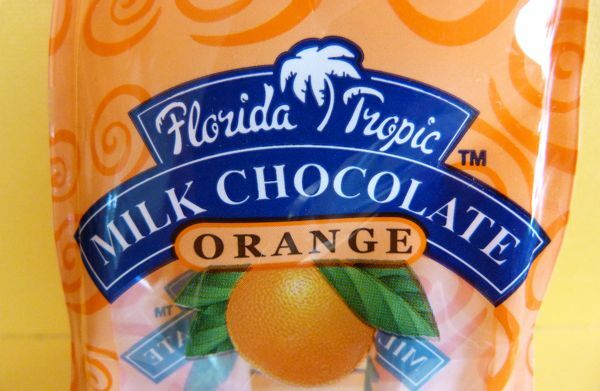 Today's Milk Chocolate Orange (A L'Orange Chocolat Lait) chocolates were from Florida Tropic/SweetWorks (Buffalo, NY). I don't associate Buffalo, NY, with the tropics this time of year, but the brightly colored orange packaging and the little palm tree logo were enough to suspend disbelief. These festive, shiny orange foil-wrapped, gumball-sized, milk chocolate orbs were smooth in texture and naturally orange flavored. 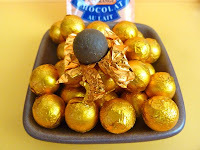 One chocolate ball was quite satisfying, and a caloric bargain at only 28 calories per citrus "fruit," making it easier to justify carefully unwrapping and eating a small handful if you're hungry. Today was Day #9 of Chocolate and All Things Orange.